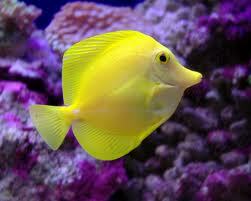 The Yellow Hawaiian Tang is for many aquarists, the definitive fish of home saltwater aquariums. With its oval-shaped, vibrant yellow body, Zebrasoma flavescensbrightens any marine system. 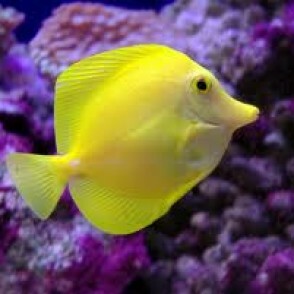 The Yellow Hawaiian Tang is an active swimmer that will glide throughout your aquarium in near constant motion, acting as an aquarium tour guide of sorts to any onlooker who follows its meandering swim path. 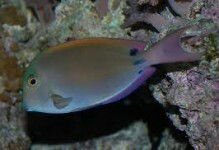 Though most common to the reefs of Hawaii, the Yellow Hawaiian Tang’s natural habitat is actually widespread throughout Indonesia and the Great Barrier Reef. 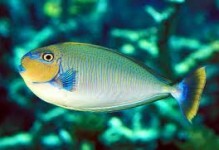 The Yellow Hawaiian Tang is also known as the Yellow Sailfin Tang or Yellow Surgeonfish. 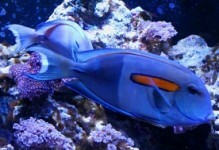 For best care, it should be housed in an aquarium of at least 100 gallons with ample room to swim. Like other Tangs, this member of the Acanthuridae family demonstrates territorial aggression towards its own species, or Tangs in general. 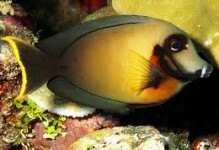 Therefore, it is best to keep just one Yellow Hawaiian Tang per aquarium, unless multiple Yellow Hawaiian Tangs are introduced into the system simultaneously. Although the Yellow Hawaiian Tang will eat meaty foods along with the other fish in the aquarium, it is important the Yellow Hawaiian Tang is offered plenty of marine based seaweed and algae. This will strengthen its immune system, reduce aggression and improve overall health. Offer dried seaweed tied to a rock or use a veggie clip, and feed at least three times per week. Sea Veggies, Seaweed Salad and Ocean Nutrition are all ideal products and are very easy to use. The Yellow Hawaiian Tang is a very common, extremely popular, and hardy addition to any fish-only or reef aquarium system.